Let’s cut to the chase, this thing is fitted with the same Ford Cleveland 5.7ltr V8 that was fitted to the Pantera, with all of those 330 horses. That would have made this one very, very fast four door when it debuted in 1971 as the Series 1. 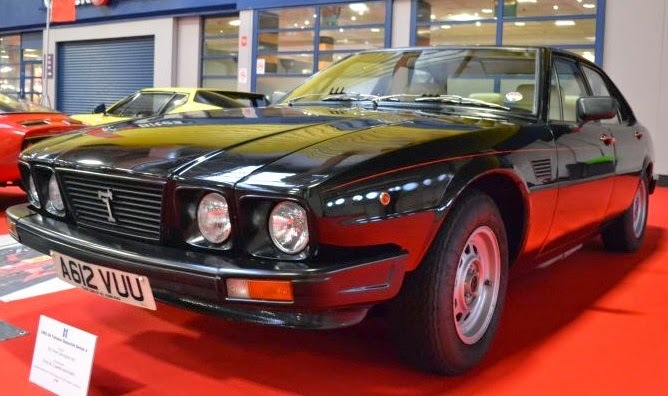 The Series 2 though like the one below were produced between 1978 and 85 and had only a few tweaks to its looks that had been penned by Tom Tjaarda under Ghia, the added louvers on the wings to aid better engine cooling (with the loss of the Ghia badges) and some upgrades to the interior to keep up with modern tastes like a digital clock. On the very late Series 2 the engine was moved 100mm backward to create better weight distribution. In total only 244 Deauville’s were built (all models) making it one very rare executive car. Many thanks to the owner of the one below (apologies I never got your name) who let me get up and close to it at the recent Lancaster Classic Motor Show. I can confirm that those seats really are as comfortable as they look and perfect for a bit of Grand Touring, the rear although looking a little snug really isn’t once you’ve sunk into the bucket seat. The one feature of this car I really did like, and the link of thing you’d miss if it wasn’t pointed out, was how when the bonnet opens it also moves the inner lights and front bumper with it. I love details like that. One thing of note about this was it shared it chassis with the Maserati Quattroporte III.